The Taste of Greener Glaslough. 21st & 22nd April 2018 in the Oakland Centre from 12-4pm. In attendance will be VOICE Ireland, Mc Elvaneys Waste & Recycling, Monaghan Co. Co., Glaslough Development, Monaghan Climate Ambassador, Waters & Communities & more to be confirmed, providing advice, tips and demo’s on greener homes, gardening, composting, greener community including local businesses with stalls selling items from pre loved clothes, jewellery, upcycle furniture, decorations and so much more that are made from reusable & recyclable material. Also on the day there will be repair services for phones, clothes, jewellery, clocks & more. It will be a jam packed weekend. Tea & coffee available & there is a free tea or coffee with every Greener Glaslough Reusable Cup bought on the day. Free entry, child friendly & wheelchair accessible! 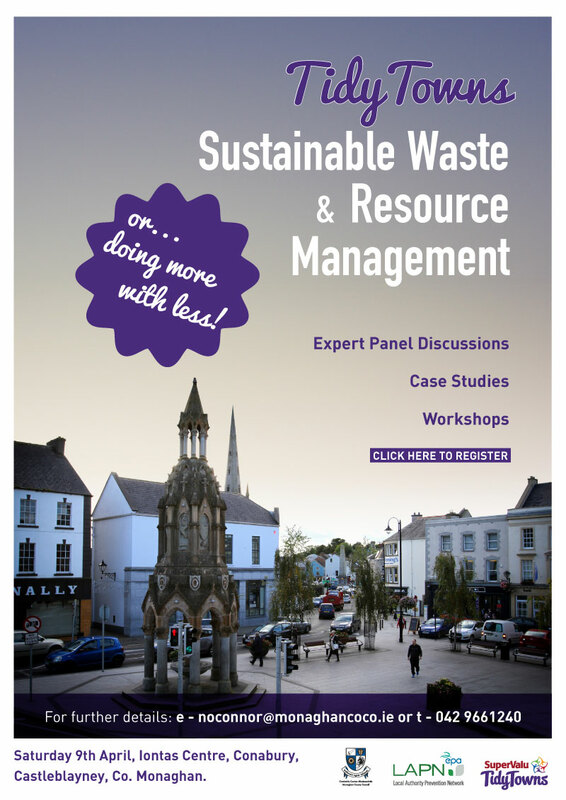 Monaghan County Council’s Environment Section is organising a conference for Tidy Towns groups on the SWRM category in the National Tidy Towns competition. The Environment Section in Monaghan Co Co has been at the forefront of waste prevention nationally for the last 10 years, and will be sharing this expertise with groups locally, regionally and nationally. There are easy marks to be picked up in this category in the National Tidy Towns competition. Attending the conference in itself would be an action in itself which you could mention in your entry! So please support. Click here to register. 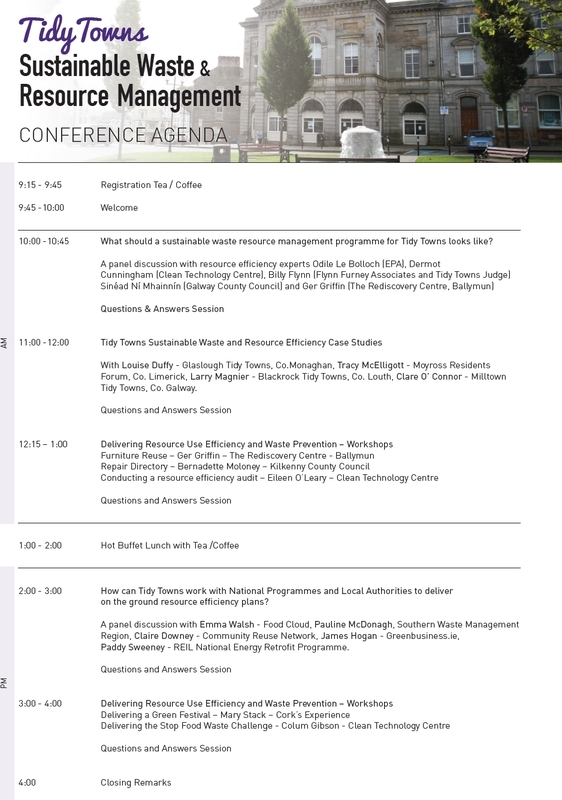 Monaghan County Council is organising a conference for Tidy Towns groups on Sustainable Waste & Resource Management in the 4 Seasons Hotel, Monaghan on Saturday 9th April. Northern Sound are running a campaign to highlight the good work done in communities by voluntary groups all year round and especially in the run up to the Tidy Towns Finals in late September. They are inviting all groups to send in pictures of their area looking its best, and they will highlight on air and through Facebook page. The Co Monaghan Network of Tidy Towns groups has organised an evening with Billy Flynn, one of the national adjudicators. Billy will go through what is involved in entering the competition and will dispense tips and tricks for writing up a good entry form and ensuring your work gets noticed by the judges. The workshop will take place on Wednesday 22nd April at 8pm in Castleblayney Enterprise Centre. This event has been moved from 15th April, to accommodate Billy’s busy schedule. The Spring meeting of the Network will take place on Tuesday 3rd March at 7.30pm in the YWCA building on the North Road, Monaghan town. The earlier time is to facilitate the guest speaker, Debbie Nesbitt, a National Tidy Towns Adjudicator who has special expertise in the new Sustainable Waste Management category. Debbie will go through what the judges are looking for, and will then go through actual entry forms and make suggestions as to how the data on the form could be improved, as well as suggesting some actions groups could undertake to bring up their score in this category. If you wish Debbie to look at your group’s entry form, please email the Sustainable Waste section to Carol Lambe by Friday 20th February, so that Debbie can take a look at it before the meeting. Managing Waste in Ireland is now divided into three regions: Connacht Ulster, Southern, Eastern and Midlands. The preparation of new regional waste management plans for the regions has been underway since late 2013 following an evaluation of the previous plans which covered ten regions nationally. The Connacht Ulster Waste Region consists of the administrative areas of the Galway City and counties Galway, Mayo, Roscommon, Sligo, Leitrim, Donegal, Cavan and Monaghan. The region represents 18% of the national population and has 36% of the land area. The regional plan provides the framework for waste management for the next six years and sets out a range of policies and actions in order to meet the specified mandatory and performance targets. The plan seeks to assist and support the community and local business to develop resource efficiency and waste prevention initiatives. A key plan target is to achieve a 1% reduction per annum in the quantity of household waste generated per capita over the period of the plan. In tandem the plan identifies measures to develop a circular economy where waste management initiatives stop being confined to treating and disposing of waste, instead supporting initiatives that value waste as a resource or potential raw material. A national launch of the three regional waste management plans took place in Galway City Council offices on the 18th of November. The launch of the draft plans coincides with the commencement of the period of public consultation which will continue until the 30th January 2015. Monaghan County Council wants to hear your views on the draft plan and about what more needs to be done. More information and the full plan are available on http://www.curwmo.ie. Also a public meeting and a presentation of the draft plan will be taking place in the Glencarn Hotel, Castleblayney on the 18th of December at 7.00pm. Interested in self-watering flower containers? Derek Jones, the sales rep for Amberol Planters, will be in Ballinode (probably Ballinode Hall) at around 11.30am on Friday 24 th October. It’s a great chance for Tidy Towns groups to meet Derek, get a brochure, and find out all about his range of self watering planters and tubs. Derek may be contacted on derekjones.amberol@gmail.com if you require more information or wish to arrange a visit to your own area.